Didgeridoo music has been around for very long time, as traditional music from aboriginal music culture. The didgeridoo instrument has an extraordinary distinctive vibration of originality - especially when traditional music of the didgeridoo is mixed with modern music sounds - to create a magical blend of world tribal fusion for groove and trance. The carefully selected tracks we proudly present here are innovative rhythms of the wild, the mysteries of timeless spirits of ancestral tones, where dreamtime and modern instruments meet in spellbinding didgeridoo music rhythms. Haunting horns, smooth melodies and animal calls stir our soul and move our feet with their mesmerising pumping low frequencies. 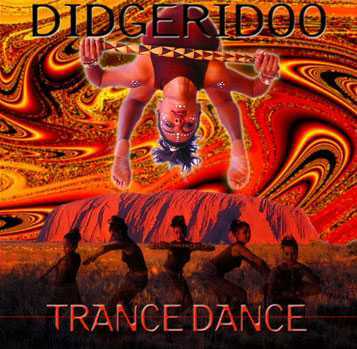 Didgeridoo music CDs from this collection brings a guaranteed earth trance experience melting boundaries and instruments. Take advantage of our exclusive economical bundles for a powerful didgeridoo music experience! The Australian outback fusion of ambient birds and world-beat mixes... getting on the dance floor, jammin' with the birds! Take a trippy voyage through world-beat ancestral tones, where dreamtime and modern spirit meet in didgeridoo music with velvet grooves, tribal voices, ambient trance and timeless harmonies. Where music of far away continents mix in a melting pot of rhythms, flutes, guitars, violins, keyboards, percussion, sound effects and nature's own sounds in addictive excellence. Pumping rhythms of the wild... droning, eternal voices of an ancient future. exotic nature sounds and rapid-fire percussion create an inter-dimensional journey into mindless spirit. Earthy didgeridoo with Australian aboriginal voices blend with UK techno-shamanic, traditional Native American Peyote chant, NYC trip-hop and Afro-Caribbean tribal rhythms... all fused into a thrilling dance compilation. Transcending space is a wild place within eternity� no time, no past.. a wormhole to the future where Mind is but a Dream Dancing Spirit. - The didgeridoo is a special instrument: only a drone can be played but an infinity of sounds is created by circular breathing, singing, rhythmic patterns and imitating animals. Mixed with worldbeat arrangements, here is a fiery trance dance! An ancient instrument blend with organic beats and contemporary sounds, will take you through the gates of Trance-Dreamtime, where outer boundaries dissolve into a pulsating inner world - Gondwana & Charlie McMahon, Hilight Tribe, Si & Wild Marmelade, Ash Dargan, Andy Graham, Yomano, 1k Science, Ariel Kalma, Papi Moreno, OKA, and other artists play with driving percussion wizards and master remixers to provoke primordial up-tempo rhythms, and mysterious fictional backgrounds of bizarre styles, all sure to trance energies around! From smooth jazz to funky jungle, from the vast Australian outback to the smoldering cyber-clubs of Bombay. Trip-out with this groove journey into the modern world of the ancient didgerioo - enhanced with drums, guitar, sax, throat singing, bass, synthesizer, sitar, native Amrican flutes and other multicultural instruments. Spellbinding didge rhythms from today's most gifted players and re-mixers in the tribal, trance-dance, world-fusion, groove and chill-out scene... Deep enigmatic tones blend with punchy percussion, haunting horns, smooth melodies and animal calls that stir the soul and move our feet to the wild mysteries of timeless Spirits. Didgeridoo music that Rocks! Evocative rhythms interlaced with soothing didgeridoo wash over your senses, enticing you into timeless dreaming, where past, present and future blend into a luminous space of harmonic perfection. Exotic cultures from around the globe offer deep sounds of the didgeridoo, didj horns, percussion, keyboards, strings and vocal incantation to initiate a mysterious journey. Did you know all the names and spellings of didgeridoo? Didgeridu, Didjeridoo, Didjeridou, Didjeridu, Didgereedoo, Didgiridoo, Digereedoo, Digeredoo, Digiridoo, Dijeridu, Dijeridoo, Digerido, Didge, Yidaki, Yirdaki, Ebroo, Bamboo, Dream Pipe, even Bullroarer!